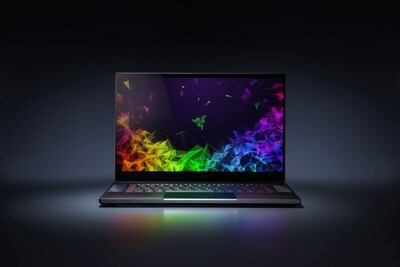 IRVINE, Calif., May 22, 2018 — (PRNewswire) — Razer™, the leading global lifestyle brand for gamers, today announced its all-new Razer Blade 15.6-inch gaming laptop1 featuring Intel's latest processor. The new Razer Blade is the world's smallest gaming laptop in its class, boasting more display area and performance features. The available 144 Hz refresh rate 15.6" Full HD (1920 x 1080) display of the new Razer Blade enhances gaming and entertainment viewing with full-frame fluid motion graphics and 100% sRGB color. Users can also step up to 4K (3840 x 2160) resolution with touch functionality and 100% Adobe™ RGB color support. The world's smallest 15.6-inch gaming laptop measures as little as 0.66-inches thin and with a minimal footprint for ultimate mobility. "We are proud to have again stepped-up as an industry leader, taking laptop engineering to the next level to give gamers the performance they require and the mobility they desire," says Razer Co-Founder and CEO Min-Liang Tan. "We upgraded to Intel's latest 6 core processor, used a fast 144Hz display driven by NVIDIA GeForce GTX 10 Series graphics, and set a new standard for power in the world's smallest 15-inch gaming laptop." Connectivity options includes the ability to output to up to three external displays via Mini DisplayPort, HDMI, and Thunderbolt™ 3. Connect peripheral devices to the laptop with three USB 3.1 Gen 1 ports. For additional viewing comfort and desk organization, Razer has made available a new Chroma Laptop Stand featuring a light strip up front and 3-port USB hub in back. When taking the new Razer Blade on-the-go, Razer also has released a new 15.6" Protective Sleeve made of durable, water resistant material with a slim profile design. The new six-core Razer Blade 15.6" Gaming Laptop starts at $1,899 and is available starting today from Razer.com and select retailers in the United States, Canada, France, United Kingdom, Germany, and China.